Hello everyone, and welcome to the January Wrap-up! This month has been a rather interesting start to 2017, to say the least, and I’d like to say it was rather productive for Of Books and Pen. For those of you who are new or haven’t been around for a while I’ve added some new things to the blog. I’m happy to announce that I have a co-blogger with me now, my friend Jill! She’s a lover of books just as I am and has done a wonderful job so far reviewing books. We will try to diversify our reviewing selection more, such as reviewing more manga, comics, or more of the various genres out there. We’re both working hard at our day jobs and so the reviews will come as quickly as our free time will allow. For any author reading, I am hoping to post more author interviews and more guest posts. I will write you an interview whether or not I’ve read your book, so that you can get some publicity even without a review. As for the guest post, if you have some already written you can shoot them my way, if not I will try to provide a wide range topics that you may enjoy writing about. I have an important PSA: For anyone looking to buy books for cheap, GO TO OLLIE’S BARGAIN OUTLET! I got seven books, four of which were hardcovers, there for less than 20$. They have a ton of books there, multiples of more popular books, and they’re all in pretty good condition too. So if you want to buy a new book but don’t want to spend too much, then please save your money and go to Ollie’s. Seriously, when I went to the one near me I thought I died and went to heaven and my wallet wept for joy. I also got a few books from Target when we went out for other stuff. Honestly, I need to stop walking by the book section. Once I start walking past those shelves I swear (not really) that I hear little muffled voices call out “Pick me up! Buy me!”. Earlier this month B&N also had a pretty cool sale going on, in which every third manga you bought was free. So Jill and I bought an insane amount of manga for a lot less than we would normally. Jill bought 9 of the Fruit Basket’s big volumes, and those were pretty heavy, while I can’t remember what all I bought. 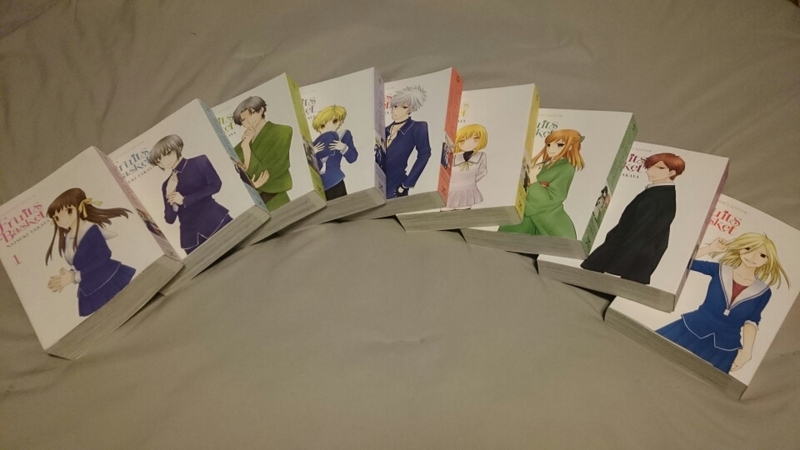 Hopefully, B&N will have more sales like this in the future because there are tons of manga that I am behind on! In February we’re going to try and get more reviews out weekly, though depending on time it may be a lot of Manga reviews in between book reviews. We will also be going to Farpoint, a convention in Maryland the weekend of the 17th. There we will work as volunteers for the con and hopefully try and help small time authors as best as we can. What have you guys bought or read this month? Outside of reading, October was pretty hectic for me with some major tests, papers, and traveling that took up a lot of my time. However, I was able to read and get some reviews out for people to read, even if a few of them were late…oops! 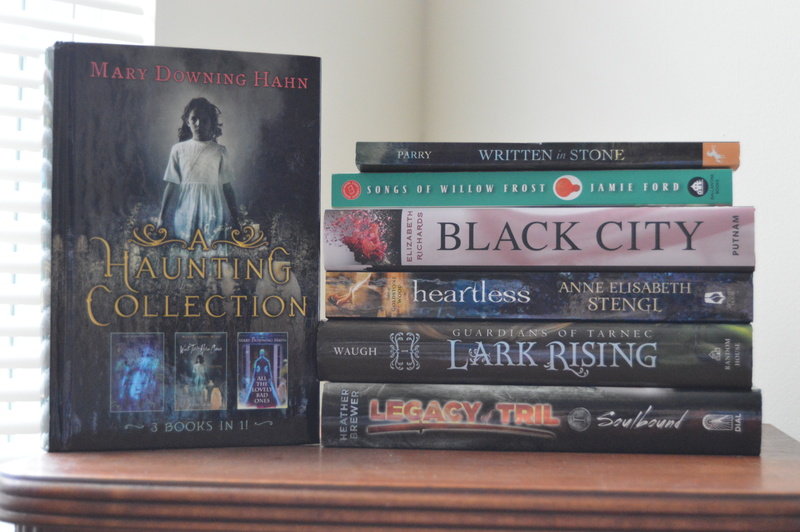 This month I decided to read some of the mysteries and paranormal/spooky books that I’ve gotten recently. I didn’t read anything super scary because, well, I’m not the biggest fan of those! However, I did read some books that got me into the spirit of Halloween this year! 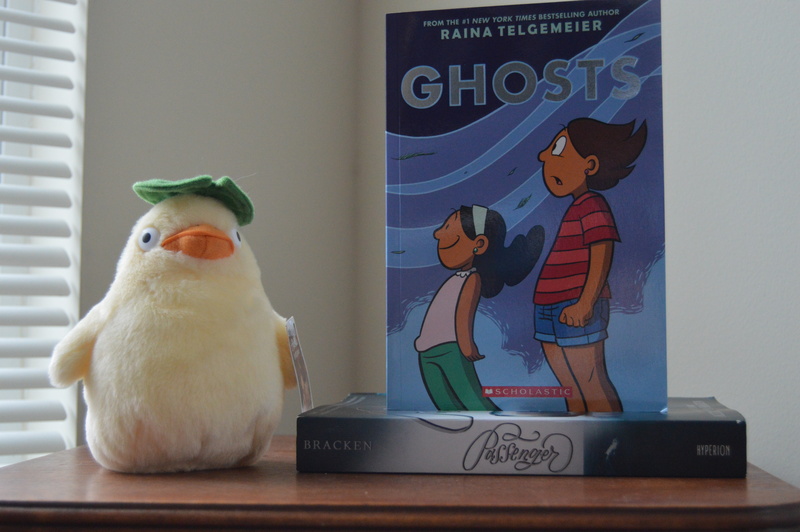 The first two books of the month weren’t really spooky, instead they were suspenseful mystery thrillers! The Golden Day was an interesting read, mostly because it was the first Australian book that I’ve read. I am Princess X was alright, it could have been better. However, the story was unique enough to keep me reading! Existence was the first book that I’ve reread since starting this blog, so it got a little bit of a different review compared to the others. It has a very simple, straight story that was fun to reread, even though the grammar wasn’t the best and the research could have been better. 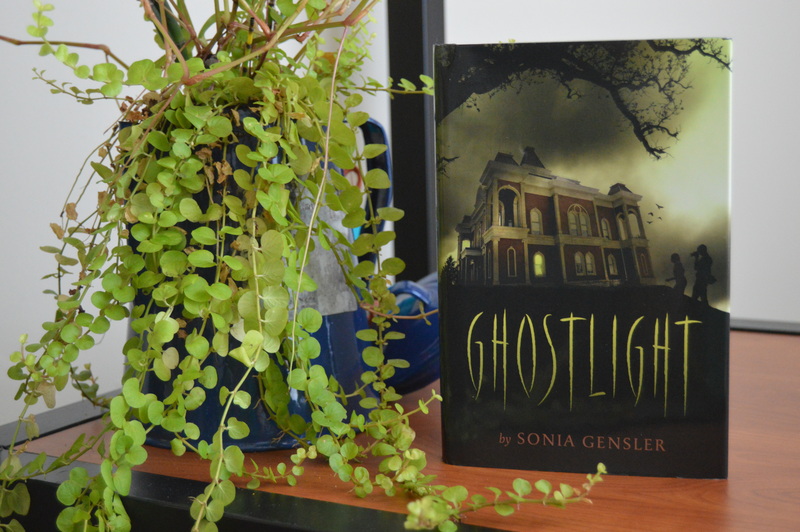 Finally, Ghostlight was the last book that I read in October and finished literally on the Eve of Halloween. Spooky and mysterious, this book definitely got me in the mood without making me want to sleep with a light on, by far my favorite read of the month! Just in case you’ve missed the reviews, here are some links to get you there fast! Towards the beginning of the month I had a three day weekend, which my school calls Fall Break…Anyways, I had the opportunity that weekend to go visit my boyfriend and some of his family in the mountains. The cute little town they lived in was really quaint and they had a used bookstore that I just to check out. Like any other time that I step into a bookstore, I carried out a few good catches that had great cheap prices! This next haul came from the weekend in which I went hunting for R.C Lewis’s newest book Spinning Starlight. There I found a few more books, including some neat redone illustrated fairy tale books (not included in the picture was my mom’s birthday present, which was a story on kid Arthur). I also picked up an interesting looking comic and the newest edition of The Nightmare Before Christmas poem, complete with a DVD of Christopher Lee reading the poem to 2-D animation! Here are some of the most anticipated releases of Young Adult fiction this month! What books have you bought/read in October? This month was pretty hot for September, well at least on my end of the world. The last few weeks of school have been keeping me busier than I expected, but I was able to read and get a review out weekly. The only book missing from this the picture is Sea of Shadows because I left it at home before I decided to do a post like this, so just imagine that book in the stack as well! Technically, I’ve read four books this month, but I only posted three reviews. I finished Queen of Shadows a few days before September ended. Unfortunately, the review is the first one of October; however I’m still counting it for September because that’s when I finished it. 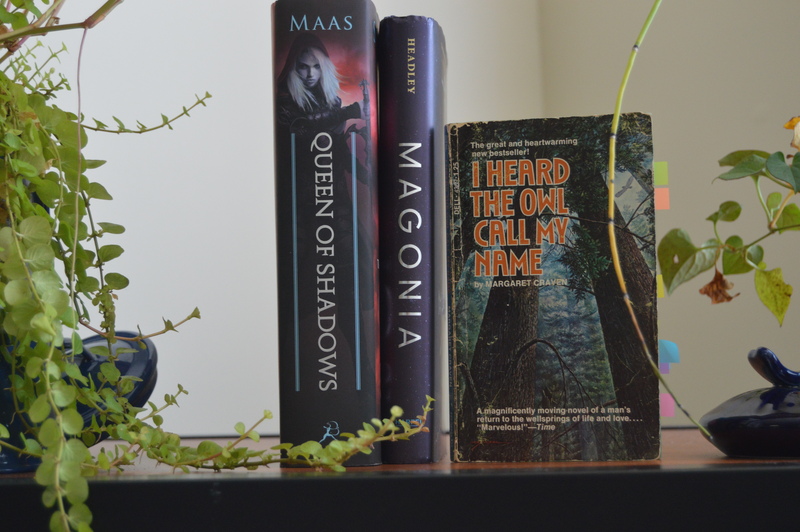 With that said, I really enjoyed each of these books for a different reason, but I would have to say that Magonia and Queen of Shadows tied for me this month! Magonia was a lot of fun to read, even with some of the issues I had about the science involved, because of how it was written, and Queen of Shadows kind of commandeered my life when it could and it was hard getting any other work done! Below are the links to each review, just in case you’ve missed them! As many readers know, Queen of Shadows was released within the first week of September so I had to go after class to pick up that lovely doorstopper, I mean this in a loving way. 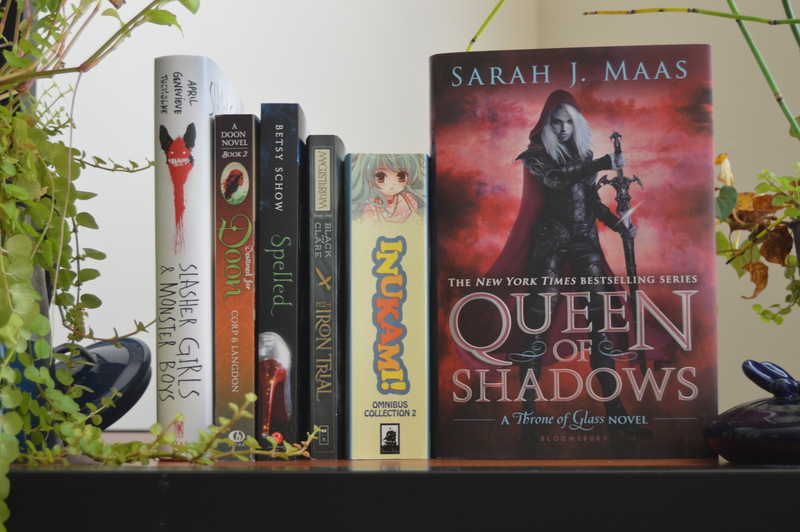 Along with Queen of Shadows, I picked up five other books, two for a friend, and the other three for myself. Buying books is like eating pistachios, you can’t just buy one book, unless you don’t like books! As you scroll down you see more pictures of books and you may be wondering what category they fall into. Well, my mother has been a member of certain books stores since forever, so they give her really cool discounts every so often to show their appreciation. This time, she had no need for the coupons and asked if there were any books I wanted. As you may guess, these were the books that I told her about that I saw when picking up Queen of Shadows. 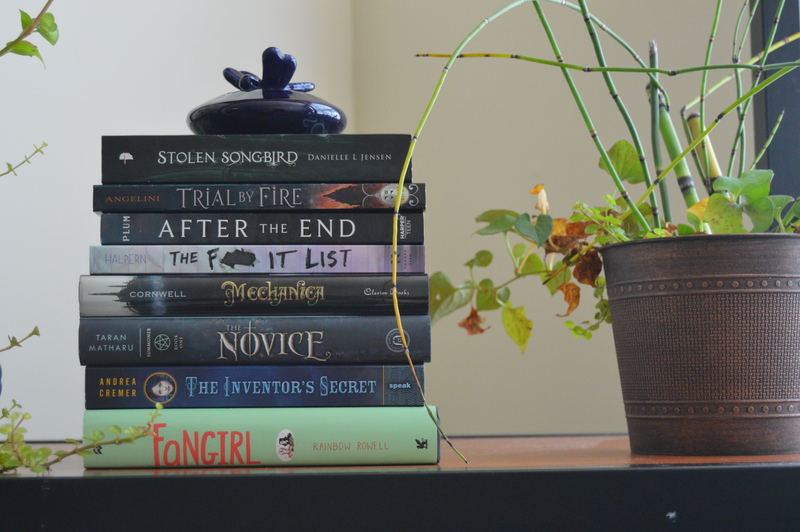 So here are some of the best/most anticipated books of this month! How many have you read or were excited for?